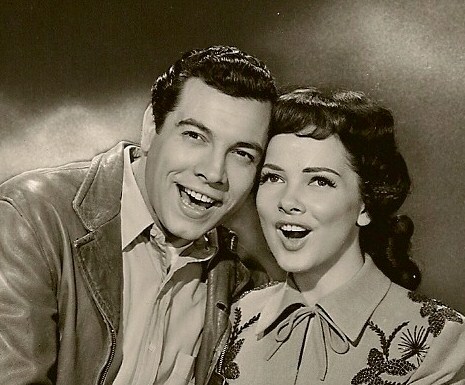 “We were shocked and saddened to hear of Ms. Kathryn Grayson’s passing. She had just celebrated her 88th birthday eight days before. Sally Sherman, her secretary and long-time friend to over 30 years, phoned Bob to explain that Kathryn Grayson passed away peacefully in her sleep. Found in bed, surrounded by her six beloved dogs, “She looked like an angel.” Sally had checked on her once and thought she was still asleep but on checking again and moving in closer, she realized that Kathryn was gone. Sally was very emotional when she recounted this to Bob, then went on to say that Kathryn would be cremated. Beautiful until the end. Damon’s ‘Aunt Kathryn’ will remain in our hearts forever. Most people are familiar with some of Mrs. Grayson’s career. As an MGM singing star in the 1940’s and ‘50’s she stared in many well known movies musicals with Andy Rooney in a 1941 Andy Hardy movie called “Andy Hardy’s Private Secretary”; with Frank Sinatra and Gene Kelly n 1945’s “Anchor’s Away”; with Mario Lanza in his 1949 film debut in “That Midnight Kiss” and in “The Toast of New Orleans »; with Howard Keel and Ava Gardner in the 1951 “Showboat” and many others. Like Mario Lanza, Kathryn Grayson was “stolen away” by Louis B. Mayer and MGM from her aspiring opera career to the movie word. She was signed when she was around fifteen to RCA Red Label Seal. 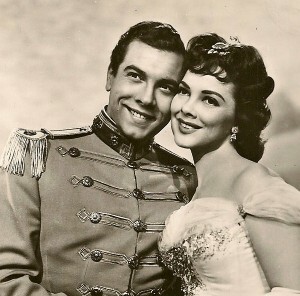 In 1962 she replaced Julie Andrews on Broadway in “Camelot” and her last movie was “The Vagabond King” in 1956, not a particularly pleasant experience. She did some singing tours with her good friend Howard Keel for a time and in the late 80’s appeared in a number of Angela Lansbury’s TV show “Murder, She Wrote”. Mrs. Grayson also gave Master Classes and taught private voice lessons. We invite you to visit her website. According to Matthew Ceccato of the Sacramento Press, the 2010 0scar-nominated shorts were being shown at the Crest Theatre in Sacramento, California. Before the first showing the curtain was raised and lowered in honor of Kathryn Grayson after her passing. When the Crest opened on October 6, 1949 Kathryn Grayson and Mario Lanza attended the showing of her film and Mario’s debut “That Midnight Kiss.” She also attended the Crest’s re-opening in 1986. What a lovely gesture. She would have been very pleased. The outpouring of condolences and tributes were many on our Lanza Legend website. She was truly loved. Honorary President of our Lanza Legend Newsletter and website, and dear friends, we will miss Kathryn Grayson beautiful voice, beautiful sense of humour and beautiful heart. “I would like to take the opportunity to say hello to the legions of loyal fans here. Mario and I appreciated your love and support over these years. You know when I first heard of Mario Lanza, it was through Ida Koverman who was the executive secretary to Mr. Mayer, head of MGM studios. She had seen and heard the Bel Canto Trio the year before and suggested that we all go to the Hollywood Bowl to especially hear this new young tenor. And so we did – Ida Koverman, Mr. Mayer, my husband, Johnny Johnston and I, for a very joyous evening. We heard this glorious voice above all others and Mr. Mayer was very impressed. – Little did I know that in one short year we would be appearing on that same stage together? Mr. Mayer of course invited Mario to the MGM studios just as he had done with me a few years before. It came the producers, directors, musicians and the sound technicians (probably everyone but the guards seemed to come) and Mario sang… And boy did he sing! Everyone was thrilled. The format at MGM reminded me of my first visit years before. I had been studying for opera and had learned ‘Lucia’ by age eleven in St Louis while training with Francis Marshall of the Chicago Civic Opera. Our family came tu to Los Angeles and I began to sing at various events. It was at this time that I was singing at the ‘All Saints Church’ in Beverly Hills every Sundays… For what I might had; $ 5.00, when several movies studios approached me, of which MGM was one of them. Being a brat at the age of 15 years old, I told them that I was studying for opera and I did not want to be in movies. They persisted and I refused, the more they persisted, the more I refused, until I was ‘advised’ by Mr. Art Rush who was a dear friend of Ida Koverman, that it would not hurt to at least talk to MGM. So I decided to go. I went to MGM one Saturday morning with my voice teacher Mennathea White. There I was with sound people, musicians, producers and directors – singing Judy Garland songs, Grace Moore songs, Jeanette Mac Donald songs and Deanna Durban songs. After hearing my singing, they sent a limousine for my parents and I was under contract before I left the studio. So I knew how Mario was feeling at this moment, as I had already been there. He sang arias and popular songs and then we sang together. The sound technicians said the two voices came together on almost the same wavelength – as one. Mario was signed the same day. And so it began. We worked together every day-singing-walking and just getting to know each other. When That Midnight Kiss was about to begin shooting, Mario and I had already done 1 Hollywood concert together, – my baby was born 11 days later, – Mario and his wife Betty had a baby girl named Colleen and Mario was down to a healthy weight of 167 pounds, after 9 months of disciplined training that he and I had done together. I put him on a strict diet and we walked a lot. This was to become a daily ritual for us and he lost weight rapidly. But now, the show must go on. 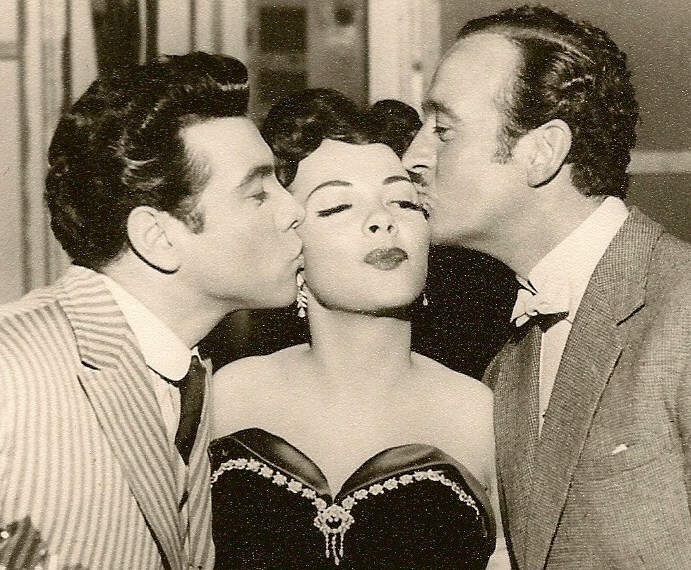 Although we only made two movies together, which wera ‘That Midnight Kiss’ and ‘Toast of New Orleans’, singing with Mario had become another brother – just as Betty had become another sister. We had such great joy working together, trying to out-sing each other… Like-who could sing the lowest- the softest- the longest and the loudest? He had such a great sense of fun and humor. I could not do this with any other singers. But Mario was fun and a great sport! And so forged a bond of love and respect for each other. His voice communicated with his audience and its beauty will remain unsurpassed. I still miss Mario and Betty.